I knew that in order to see a real shift in the way things could go for me, I would have to think better. This did not include the way others thought, I was the one that needed a little mental adjustment. I Had to Create a Vision for My New Year. When I didn’t create an actual visual plan, I didn’t have any where to grow. It was important for me to determine what I would like to accomplish in the New Year. Once I wrote it down, then I created a vision board to be a reminder for where my life could actually go. I Had to Change My Daily Habits and Environment. My daily habits were very important in how my current year would turn out and then how my future years would be. I had to evaluate my morning and evening routines. This included how I spent my time. It was up to me to read more, journal and meditate, avoid gossip, listen to inspirational teachers, and even take classes that could help me grow into a better person and entrepreneur. My New Year Didn’t Just Start on January 1st. I embraced the New Year well after January 1st when I decided to shift gears. Your new year can start on the January 1st, May 10th, October 17th. It all matters when you decide to change how you view your world and make actionable steps to create a better life for you and those that you love. 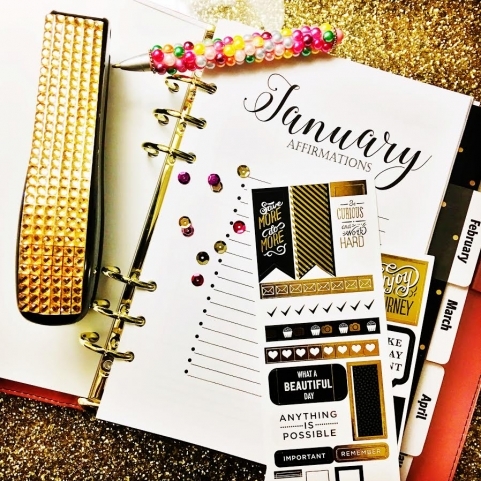 I Learned to Set Goals, Not Resolutions! My goals are my road map. They keep me focused on what I need to give my attention to and what I need to avoid. I first decided on what I wanted to accomplish in 3 months, 6 months, 9 months and then 1 year. And, then I added 3-5 years to the plan. By the end of the year, I was able to actually review what worked, didn’t work and so on. And, then I could celebrate being a goal achiever and not letting life just happen for me. I Made Writing a Habit. I also keep track of my thoughts, prayers, and big ideas. Inspiration follows us everyday and I want to capture it so I keep my paper and pen ready at all times. Gratitude is very important in shaping our days. Each day became a mission to seek what I was thankful for. I purchased thank you cards (if I didn’t make them myself) and made sure to send a thank you card to a client, friend, or the sweet postal worker. And, in my journal, I keep a gratitude list. This list contains everything that I can think of to be grateful for, you know, the things that we take for granted such as, electricity, family, health, gas in my car, clients, a driveway, dishwasher, you name it. Although it may sound silly to list little things, I truly believe that what you are grateful for, you are open to attract more into your life. I am so grateful for 2016! So many great things happened for me and my family and then there were some moments where I thought I wouldn’t make it physically or mentally. But, I choose to embrace the celebrations and the lessons. They will help guide me into the new year. I’m so excited for the new things that I will have the opportunity to do within my business and the changes that are slowly showing. It takes a leap of faith to do anything that you are not comfortable with. And, 2017, I plan to do things more fancy, focused, and fearless. I pray that you celebrate more in 2017 and that you embrace all the wonderful things that life truly has to offer you. Thank you to each of you that allowed me and my team to celebrate with you in one way or the other. Your support and love has been overwhelming and a true blessing. Here’s to a FANCY, FOCUSED, AND FEARLESS 2017!